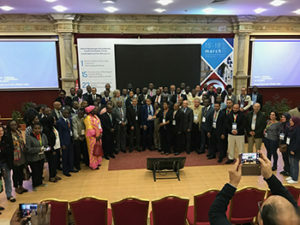 Delegates gathered for a photo at the conclusion of the first meeting of the African Academy of Neurology conference, in Yasmine-Hammamet, Tunisia. The first African Academy of Neurology (AFAN) conference and the 15th Pan Arab Union of Neurological Societies (PAUNS) meeting provided a unique opportunity for both societies to meet on the same premises and hold their first joint congress. More than 500 delegates attended; they represented 52 nationalities from five continents. 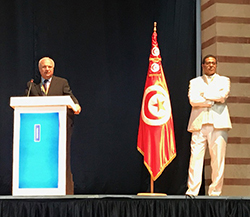 The Tunisian Society of Neurology, on behalf of the African Academy of Neurology and the Pan Arab Union of Neurological Societies, organized the meeting. To help young participants attend, the WFN, the American Academy of Neurology (AAN) and the European Academy of Neurology (EAN) initiated a joint sponsorship. The Tunisian Society of Neurology was helpful and generous in supporting this event. 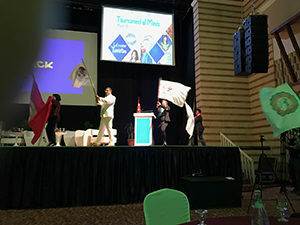 The congress took place in Yasmine-Hammamet, Tunisia. The staff of the Neurology Department of Tunis served as host and conference organizer. Helping to make the conference a success was that it coincided with the Tunisian National Day of Traditional Dress. Flags from several continents were carried across the stage during a colorful ceremony. The sessions were well attended and featured lively discussions. The opening session tackled inflammatory neuropathies, coma, paraneoplastic syndromes, and recent advances in the understanding of Parkinson’s disease. 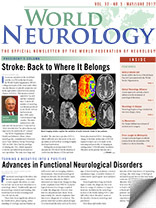 Many topics deserved attention, including inflammatory aspects of the neuromuscular system, new investigation techniques, and new therapies. The meeting’s scientific program contained courses on epilepsy, stroke, and botulinum toxin use in dystonias. The program featured interesting e-poster presentations, which were well organized and showed promise that e-posters will be an important aspect of future meetings. The Tournament of the Mind winners were Dr. Osheik Seïdi, from Sudan, and Dr. Sywar Triki, from Tunisia. The AFAN business meeting concluded with the selection of Prof. Fuad Abdallah, from Egypt, as president-elect, and Prof. Shamsideen Abayumi Ogun, from Nigeria, as president. The PAUNS business meeting also was held during the conference, with Prof. Chokri Mhiri, from Tunisia, elected president. The WFN was represented by its president, vice president, general secretary, and two elected trustees. The EAN president and an AAN representative also attended. Conference organizers overcame many challenges. Besides organizing a large meeting, they brought together different societies and interests, and coordinated the travel needs of participants from low-income countries to make it affordable.